Traffic is now switched to the permanent junction layout. 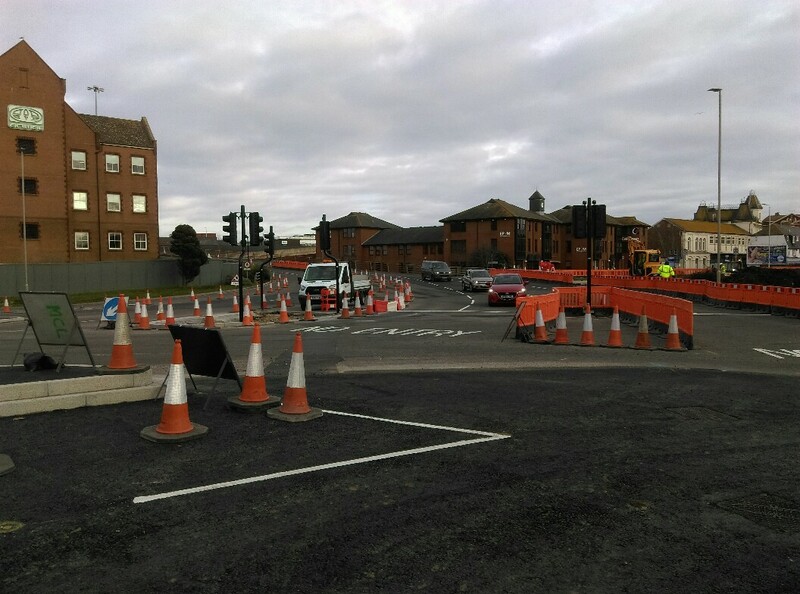 The temporary traffic lights that have been in operation since we started have been moved to the Asda junction ready to be set up ahead of our works there. We will still need to take out lanes at times as we have been doing at off peak hours to enable safe working for our workforce and to protect the public. The white lines we installed over the weekend will be replaced toward the end of our works as the entire junction will be resurfaced with a nice new top layer once we stop making holes in it, at this point the lines will be re installed in full with all the new signage. For the time being we will use the redundant roundabout as a storage area, this will eventually be turned into a landscaped area. 23rd, 24th, 25th Jan we have a tarmac planning machine returning to cut out lines for new kerbing in any area we can get it onto. The planer cuts out the tarmac far faster than we can break it using excavators and is much quieter, we also end up with a re-cyclable material as the planings can be used as backfill in the new islands we are building and footpaths, it is not classed as suitable to use under highway though. We will be installing drainage and electrical ducts and ducting for the traffic loops that sense vehicle movements and link with the new traffic light system. Also kerb laying to the new Town Gate bridge central reservation and across what was the old roundabout entry and exit, new alignment around the old Animal offices and two small islands we have not been able to build yet in the middle of the new junction. 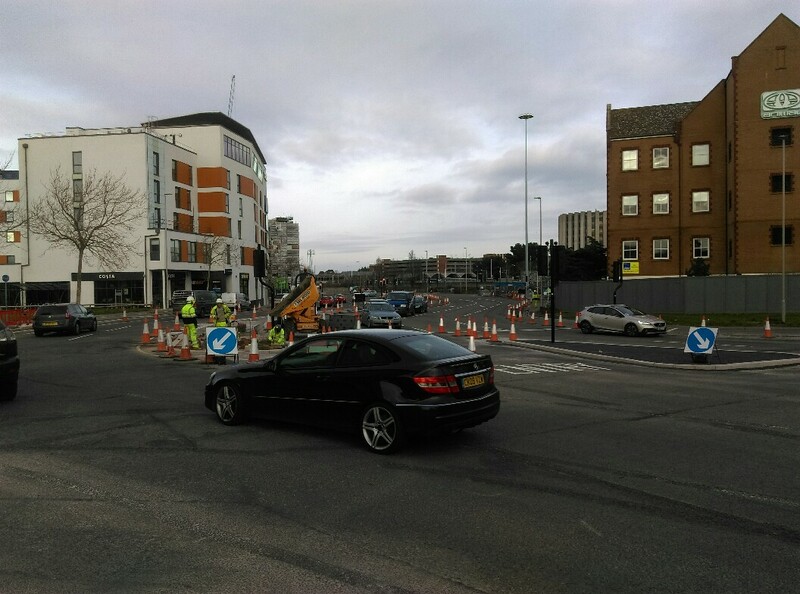 Access onto Dear Hay Lane is now closed completely from the old roundabout and the proposed new West Street Junction for around 6 weeks whilst we build the new link road. This is necessary as there is simply not enough width to allow vehicles, pedestrians and our workforce to carry out the required works. First operation will be to install a new road gully outside the Brew House, we usually start constructing the deepest item in our works first and build upward, drainage is usually deepest part of our works on a highway scheme. The new road re-alignment will soon be visible once we start laying kerbs. This part of Dear Hay Lane will have a coloured pattern imprinted surface when we complete it. 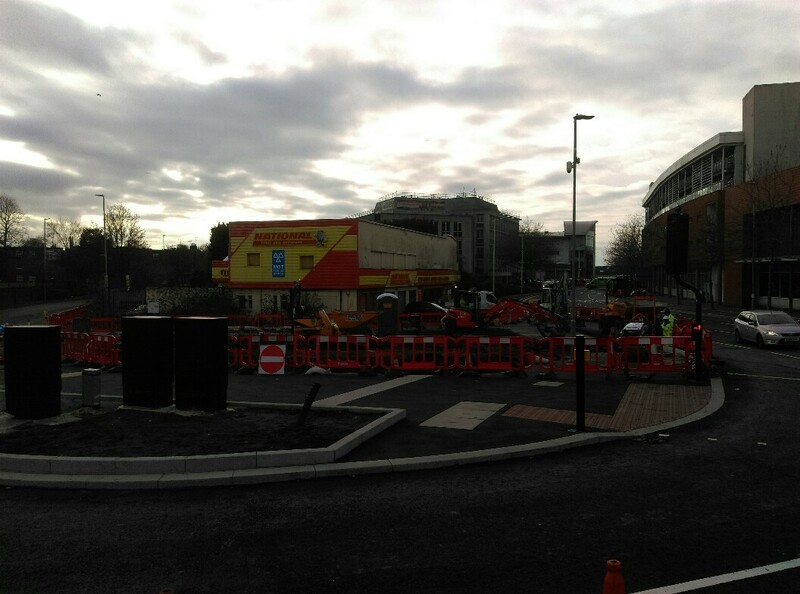 Our works terminate just past the Brew House on the Chapel Lane car park entrance. Access onto Dear Hay Lane will still be possible with a short diversion from New Orchard as will access to Chapel Lane car park with just the section outside Brew House closed. 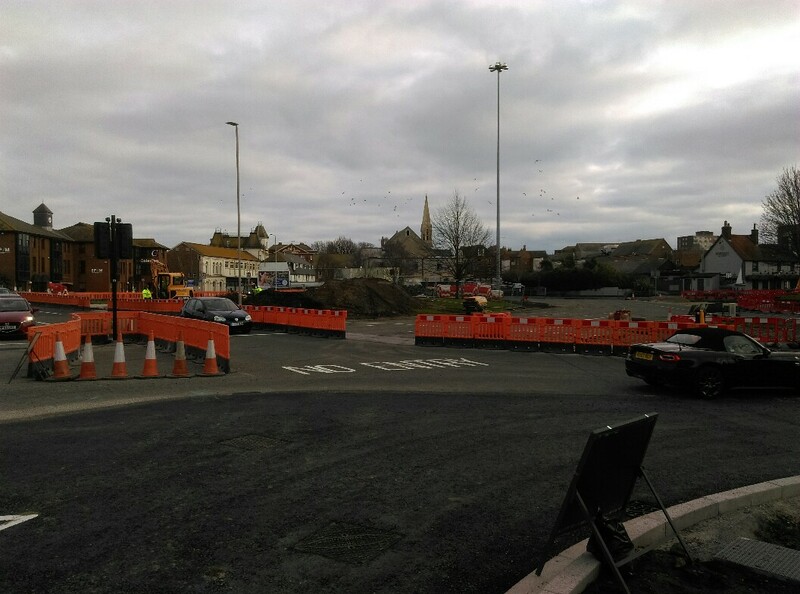 Early to mid February we will be starting works at the Asda lights junction following setting up of temporary traffic lights similar to what we had been using at Hunger Hill for the last few months.